For transit agencies in San Diego and Denver seeking additional funding, recently completed naming rights agreements with local universities promise a consistent source of income. The San Diego Metropolitan Transit System (MTS) agreed to a 30-year naming rights agreement with UC San Diego Health, while Denver’s Regional Transportation District (RTD) finalized a branding agreement with the University of Colorado. Along with potentially serving as additional revenue streams for the transit agencies, these agreements also promise extra visibility opportunities for the universities involved. Under MTS’ agreement with UC San Diego Health, the agency’s Blue Line trolley system will be renamed the UC San Diego Blue Line. MTS is currently working with the San Diego Association of Governments, the California Department of Transportation, elected officials, and other stakeholders to develop and complete an 11-mile Blue Line extension from Old Town to University Town Center by 2021. UC San Diego Health will also receive naming rights to an existing Blue Line station at Old Town, along with planned stations at the UC San Diego main campus and at the health campus in La Jolla — including UC San Diego Jacobs Medical Center, which is scheduled to open in 2016. Over a 30-year period, MTS will receive an annual fee that starts at $675,000, with subsequent increases based on completion of the Blue Line expansion project and the local consumer price index. “Clearly, it gives us a sustainable piece of revenue — it’s non-fare revenue, and not impacted by state decisions. In the past, the state of California has reduced funding for transit, but this portion of money is immune to that,” said Rob Schupp, director, marketing and communications, for MTS. The agreement also promises additional exposure opportunities for UC San Diego Health, which is particularly crucial in the competitive hospital industry, according to Schupp. MTS and UC San Diego have worked together to promote public transit use since 1969. RTD’s agreement with the four-campus University of Colorado system covers the A Line commuter rail from Union Station to Denver International Airport, which is the first of five new transit lines RTD plans to launch in 2016. 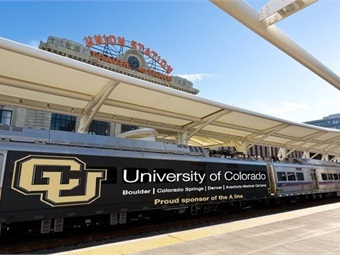 In addition, the branding and naming rights agreement includes advertisements on the Flatiron Flyer bus rapid transit line that runs from Union Station to Boulder, along with exterior ads on the rail and bus vehicles, and the use of the University of Colorado’s name and logo on RTD digital and print materials related to the A Line. RTD will receive $5 million under the five-year deal, with a provision for a five-year extension upon agreement of both parties. According to Scott Reed, assistant GM, communications, for RTD, the agreement benefits the agency from a financial and community image standpoint while providing additional brand visibility for the university. “It gives the university an extremely visible presence from Denver International Airport, for travelers and businesses from all over the world. Plus, the line will be identified as the ‘University of Colorado A Line’ in all of our maps and online information,” Reed said. Ultimately, Reed believes that RTD’s agreement with the university will lead to more interest from businesses and institutions. “A lot of times, people are hesitant to be the first to participate in a naming rights program, and, since the University of Colorado has jumped in with both feet in a big way, we think that this will get a little bit of competition going because there are a limited number of highly visible opportunities within our system,” Reed said.